The Eureka E100 is an innovative ride‑on scrubber-dryer, engineered to guarantee exceptional performance even on the toughest industrial floor. With its compact size and impressive maneuverability, the E100 delivers unmatched performance in commercial areas. The E100 has been designed to ensure operator comfort and easy operation. Simple and intuitive controls, excellent visibility and high maneuverability make it extremely safe and easy to use, even by unskilled operators. Its extremely low noise level makes the E100 the ideal machine for cleaning at any time in any type of building. The E100, equipped with the exclusive ECOsystem®, provides savings up to 80% in comparison with conventional machines. Manufactured with high-quality materials the machine is robust and reliable ensuring further reduction in running costs. Durable stainless steel brush with an overall a cleaning path of 96 cm delivers incomparable productivity. Boost cleaning capacity up to three times on a single tank, the ECOsystem® effectively recycles active solution and increasing productivity. Adjust in real time the proportion of detergent and water delivered to the ground. Full view of the detergent container enables the easy monitoring of consumption and rapid replacement. Take full control of brush pressure and adjust according to the floor surface via a simple control, for consistently brilliant results no matter what the environment. The stainless steel squeegee can be easily adjusted without tools, guaranteeing optimum water pick-up on any floor type. Only the best blades: Linatex® or PRIMOthane®. The blades are reversible. 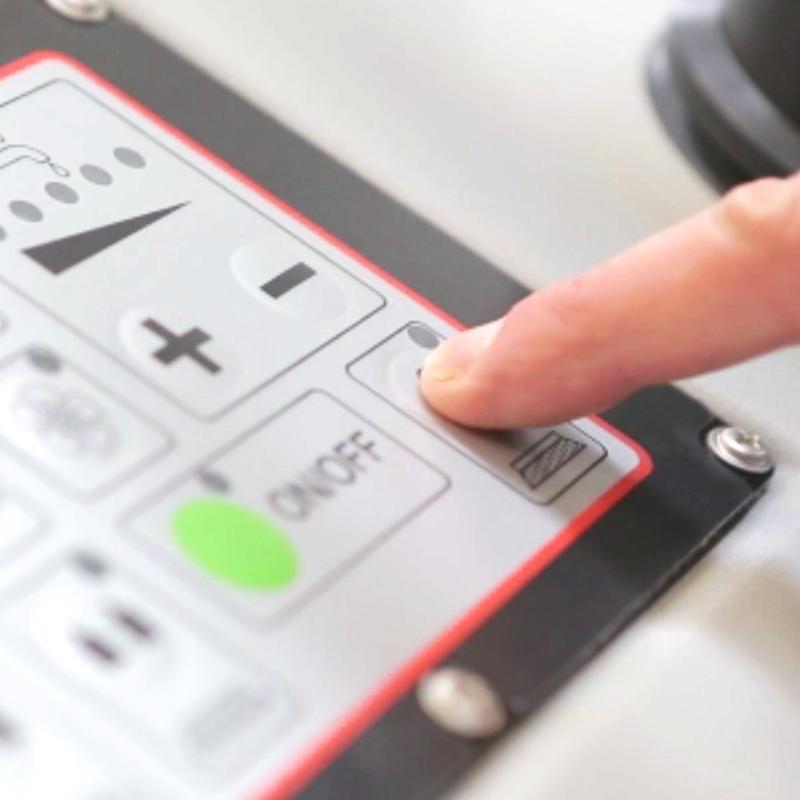 Coupled with the “quick-change” system reduce maintenance costs and downtime. Is equipped with intuitive, simple to use one-touch controls. Brushes can be simply released and connected automatically, no tools, no time wasted. The motor is fitted inside the nose of the machine and is therefore protected against impact and humidity, it drives the front wheel via a lubricated gearbox. Long life battery for maximum running time, can fit battery pack up to 300 Ah. On-board battery charger for easy, safe charging. The skirt automatically adjusts to the floor surface to avoid leakage of solution and to ensure optimum water pick-up. The fitler protects the vacuum-motor against dust/debris to ensure greater durability and a longer life. The stainless steel basket retains all bulky waste collected during the drying phase, allowing for quick and easy disposal. The hose end is flexible to control the flow of water when emptying the recovery tank. Activate the recycling ECOsystem® and increase tank capacity from 120 L to an impressive 360 L. Convenient access to the tank enables easy filling and maintenance. 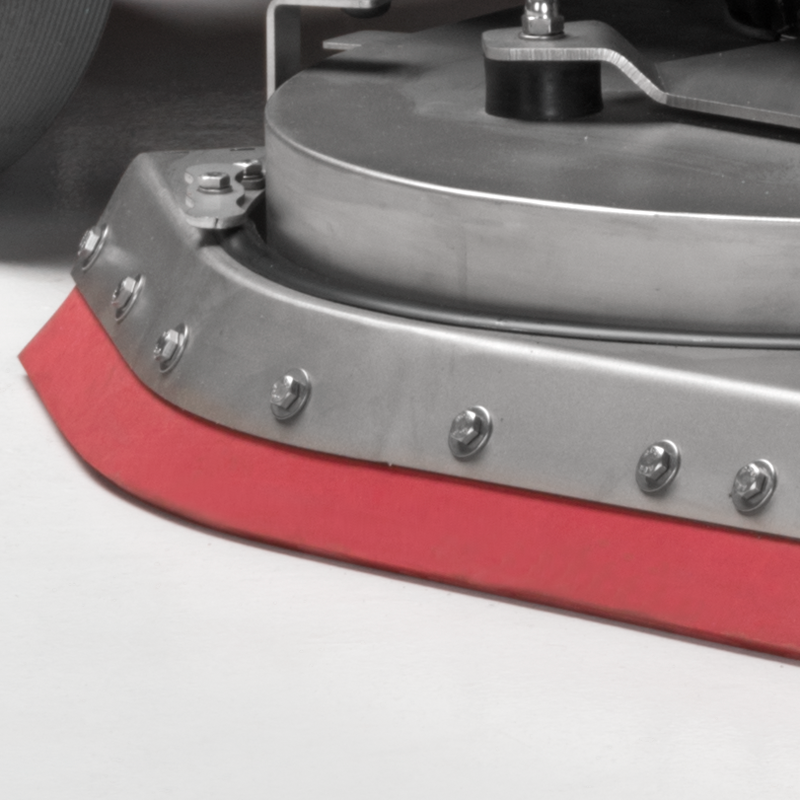 Full access to the recovery tank facilitates easy cleaning to maintain tank hygiene. The E100 in Chrome® with stainless steel frame guarantees even greater resistance to rust, humidity and the corrosive action of aggressive detergents. Scrub deck and squeegee are in stainless steel as standard. The Water Technology List (UK) promotes and rewards products that enable reductions inwater consumption. Eureka scrubbers fulfil all the given criteria and are therefore on the list.